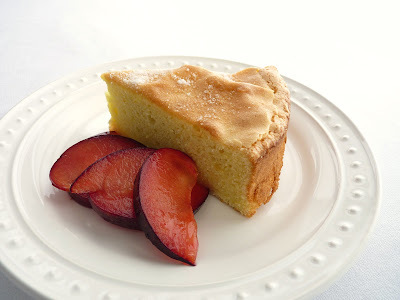 I like to have a few simple cakes in my repertoire to serve with all the great fruit of the spring and summer months. They make perfect partners when you want the ripe freshness of the fruit to be the star. 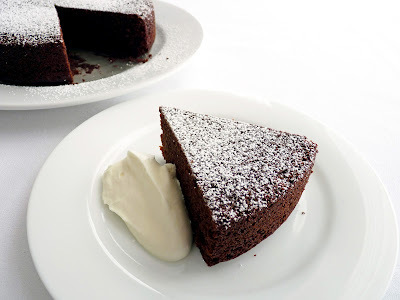 I also love the use of olive oil in pastry and this cake really demonstrates why. 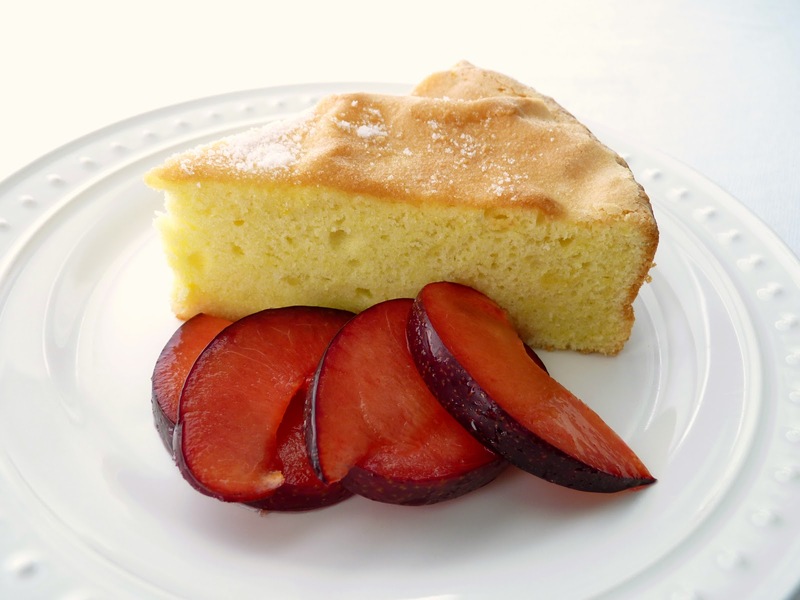 It adds an assertive flavor and moisture that is unmistakable in plain cakes and complements the fruit in a way that adds another interesting dimension to dessert. I serve it here with fresh sugared plums and the bright tart acidity is a great pairing. Since there's no leavening in this cake, it's important to beat the egg yolks and sugar to ribbon stage. The egg whites are also beaten to soft peak and folded into the batter to lighten it and give it more volume. As a result, the cake souffles a bit as it bakes and then deflates slightly as it cools, giving it its buckled and crackled surface. 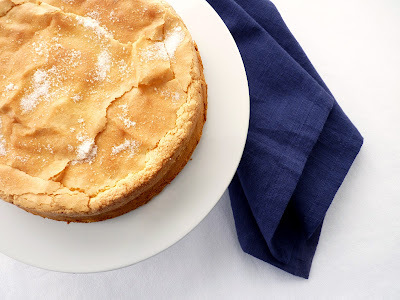 The cake has a density a bit like a pound cake but is airy like a sponge cake and light as angel food. I like the full-bodied richness of extra virgin olive oil but you can use regular olive oil if you want a subtler flavor. The cake would go well with just about any spring and summer fruit served plain or poached in wine. 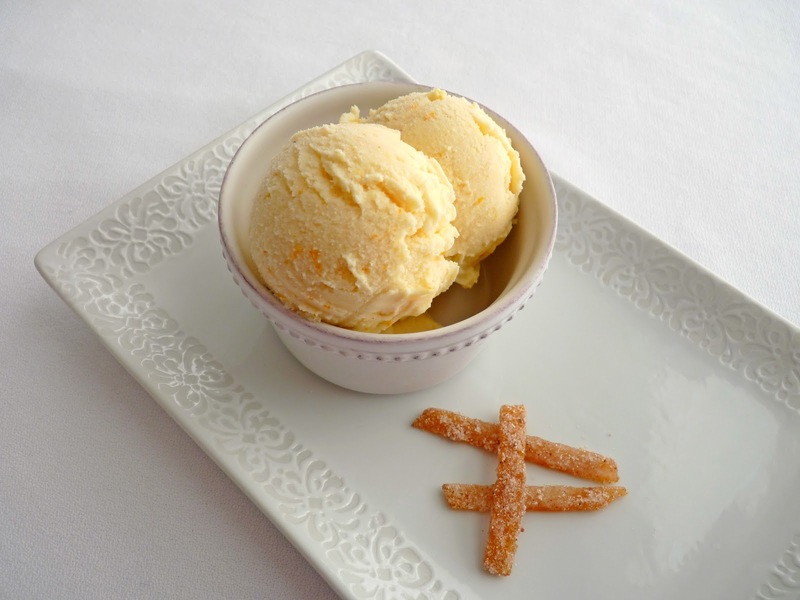 A dollop of whipped cream, lightly flavored with vanilla or kirsch, is also a very welcome garnish. - The cake rises considerably so you need a springform pan with sides that are at least 2 1/2" high. - I used wonderfully fruity California Olive Ranch Arbequina olive oil. - The recipe calls for cake flour but I also tested it with all-purpose and it's delicious. - Fat is the enemy of egg whites, so be sure you've thoroughly cleaned your whisk after beating the egg yolks before you start beating the egg whites. If there's any fat present, the egg whites will refuse to whip! - To beat the egg whites to soft peak, start with the egg whites and the salt and whisk them on medium speed. When they've reached a thick and opaque foamy stage and doubled in volume, slowly add the sugar. They will stay at a soupy stage for a couple of minutes but then start to incorporate more air. Keep beating until they are cloud-like and about tripled in volume. When you lift the whisk, they should stand up in a soft peak with a slight lilt. They won't be as shiny or stiff as a regular meringue because there is less sugar. - The recipe calls for 1 1/2 tablespoons of lemon juice and 1 1/2 teaspoons of lemon zest, which is approximately 1 lemon, but I think it needs more lemon zest. I used the zest of 1 1/2 lemons. - Don't skip sprinkling the sugar on top. This is not a very sweet cake and it needs that extra 1 1/2 tablespoons of sugar. - The recipe calls for baking the cake for about 45 minutes but mine was done in 30 minutes. So check the cake when the aroma is pronounced and test for doneness. 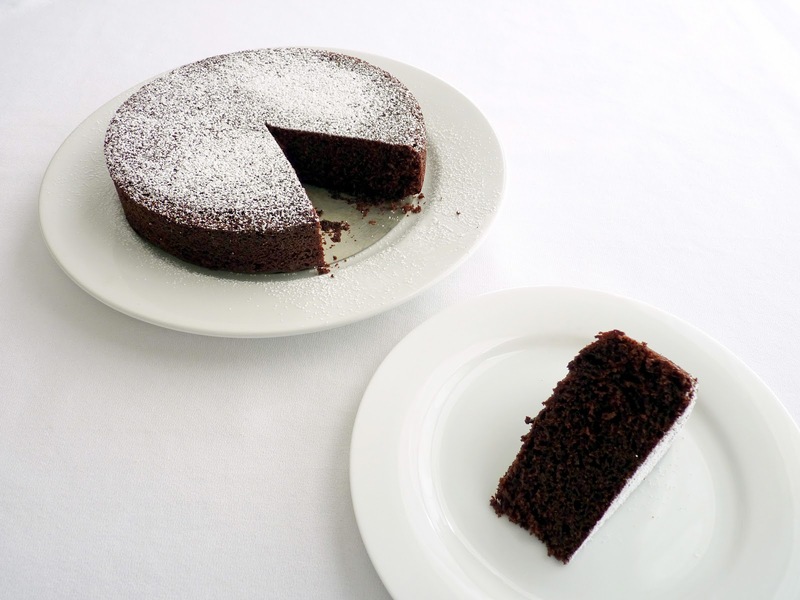 - The cake can be made a day ahead and stored in an airtight container at room temperature. - I sliced 4 plums into thin wedges, sprinkled them with about 1 1/2 tablespoons of sugar and then set them aside for 15 minutes to macerate. I also added a couple of drops of good quality kirsch. - For whipped cream, I usually use about 2 - 3 teaspoons of sugar per cup and about 1/4 teaspoon of vanilla extract. Or as a nice alternative for summer fruit, add just a couple drops of good kirsch. - I've started a Tools board on Pinterest for quick sourcing of basic tools and techniques for pastry making. You'll notice that I prefer uncoated pans and baking sheets. I think they're the best for even baking and consistent results. Preheat oven to 350 degrees. Lightly grease a 9" x 2 1/2" springform pan and line the bottom with parchment. Beat the yolks and 1/2 cup of sugar until thick and pale. When lifted from the whisk, the batter should cascade in ribbons onto the surface and hold for a couple of seconds. Reduce to medium speed and drizzle in the olive oil. Combine thoroughly and then add the lemon juice and zest. The mixture may look a bit broken. Take the bowl off the mixer, sift half the flour onto the batter and fold it in gently but thoroughly. Sift in remaining flour and fold until combined, making sure to scrape the bottom and sides of the bowl. Beat the egg whites with salt until they are foamy and expanded in volume. Slowly add the sugar a little at a time and continue beating until they hold a soft peak. Fold a third of the whites into the yolk mixture to lighten the batter, then fold in remaining whites. Pour the batter into the prepared pan and gently rap the bottom on the work surface once or twice to release large air bubbles. Sprinkle the top with the remaining 1 1/2 tablespoons sugar. 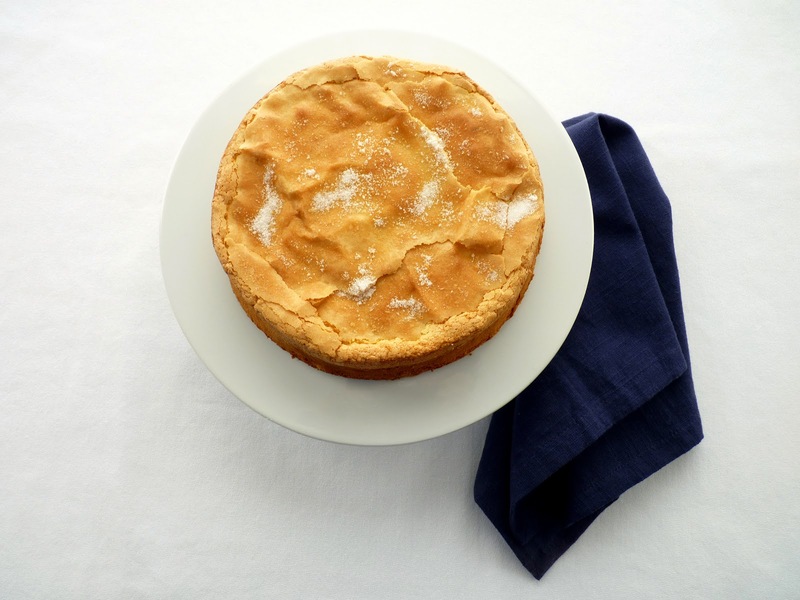 Bake until the cake is puffed and golden and a tester inserted in the center comes out clean, about 30 - 40 minutes. Place on a wire rack to cool. Run a thin-bladed knife or metal spatula about the edge of the cake to release any areas that might be sticking to the pan. Cool 10 minutes and release the metal ring of the springform pan. Cool completely. Gently invert the cake and remove the parchment. Invert again onto a serving plate. 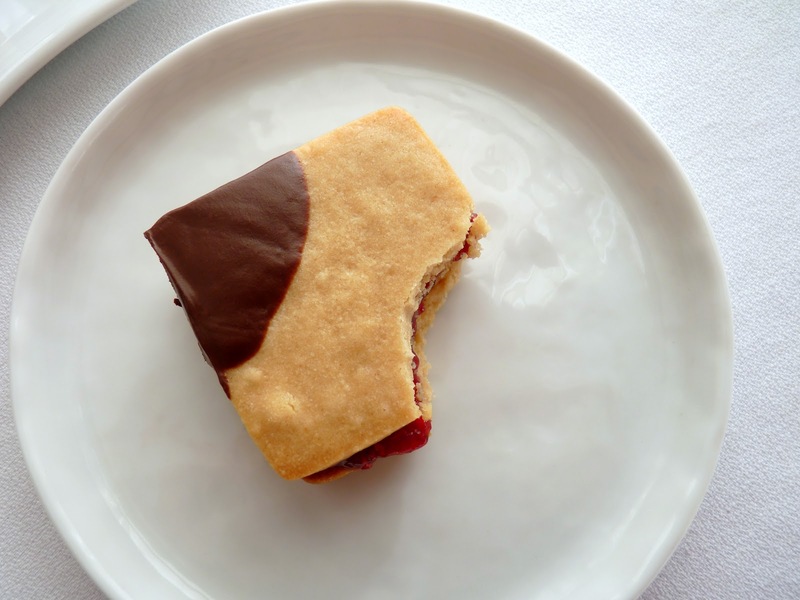 This yeasted pastry is very reminiscent of old-fashioned fantail biscuits. 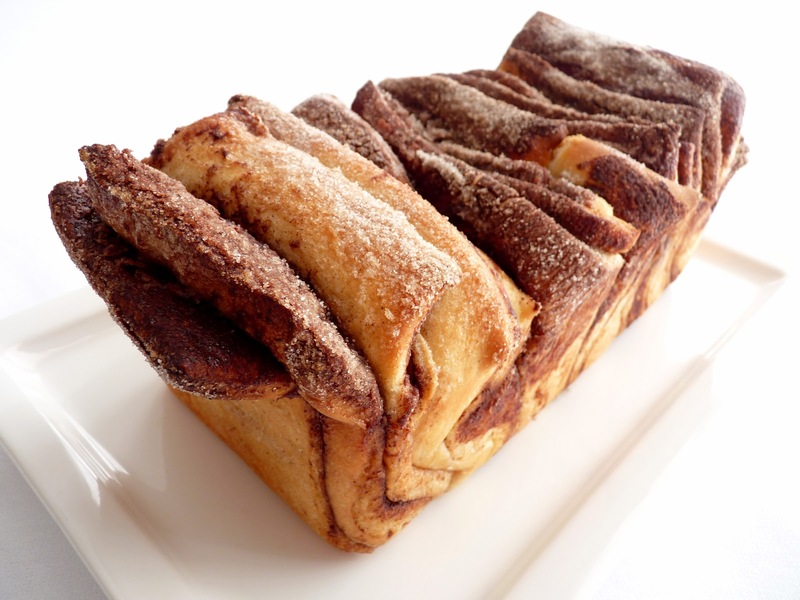 It's a wonderfully soft yeast dough that is layered with a loose paste of butter, cocoa and Grand Marnier and sprinkled with cardamom sugar. Instead of forming individual biscuits, the dough is cut and stacked and placed upright in a loaf pan. The components are very simple and it's an appealing presentation that definitely does beg to be pulled apart. As the loaf bakes, the layers expand beautifully, displaying a bit like the pages of a well-worn book. I love the crusty sweet exterior of the loaf and the tender delicious interior. It's not overly rich or sweet but just right. 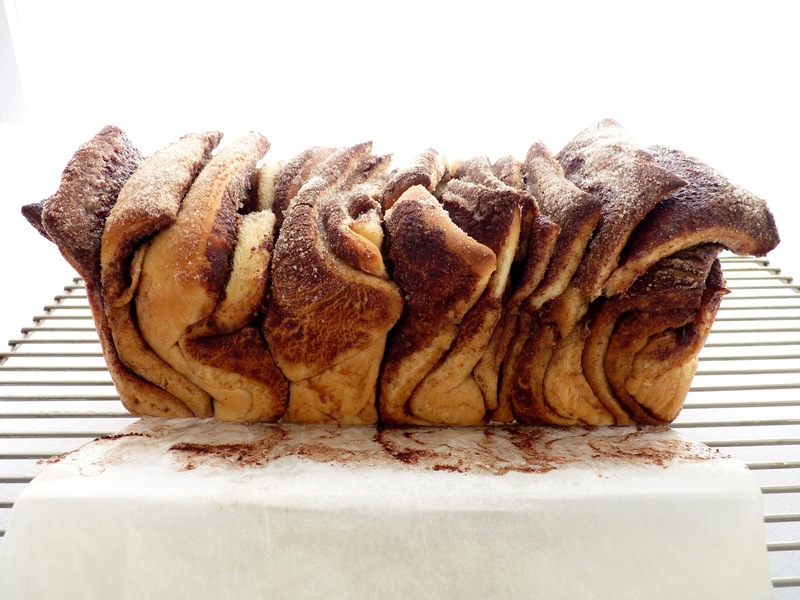 If you like working with yeast, this definitely ranks as an easy alternative to cinnamon rolls. And as we head into brunch season, it would be the perfect thing for your guests to tear into and enjoy along with a steaming hot cup of good coffee. - The water to proof the yeast should be warm, not hot, to the touch. Technically, if you have a thermometer, the temperature of the liquids for yeast should be 110 - 115 degrees F. This is just above body temperature. If adding liquid to yeast that has been mixed with dry ingredients, the temperature has to be higher, about 120 - 130 degrees F.
- Salt is important in yeast dough because it slows the rising time and allows the full flavor of the dough to develop. It also strengthens the gluten and builds the structure of the bread by keeping the carbon dioxide bubbles from expanding too quickly. Sugar not only adds flavor, it's also a browning agent. - As you line the loaf pan, the pieces may slouch and the sugar may shift a bit. That's all OK. Each loaf has its own character! - There are other ways to prepare the layers. You can also spread and sprinkle the filling as you stack the long layers but I think that makes it a bit harder to distribute the filling evenly. - Remove the baked loaf from the pan after a few minutes to prevent the bread from getting soggy. - No need to cut the portions; just dig in and pull apart the layers! For the yeast dough, place warm water into a large wide bowl and sprinkle the yeast over it along with a tiny pinch of sugar. Whisk to combine and set aside for 5 minutes. Heat the milk and butter together just until the butter melts. Take off the heat and add the sugar, salt and vanilla. Add to the yeast mixture and whisk in the eggs. Switch to a fork and stir in 2 3/4 cups of flour. If necessary, keep adding flour 1 tablespoon at a time until the dough is no longer sticky. Place the dough on a work surface and knead until soft and elastic. Grease a large wide bowl with oil and transfer the dough to the bowl. Turn the dough over to coat all sides. Cover the bowl with plastic wrap and set aside in a warm place to rise for 1 hour until about doubled in size. Lightly grease an 8 1/2" x 4 1/2" loaf pan and line with a piece of parchment large enough to form an overhang on both sides along the length of the pan. For the filling, melt the butter over medium low heat. Whisk in the cocoa. Cook, whisking constantly, for just another minute to let the flavor and aroma of the cocoa bloom. Take off the heat and add the Grand Marnier. Set aside to cool. 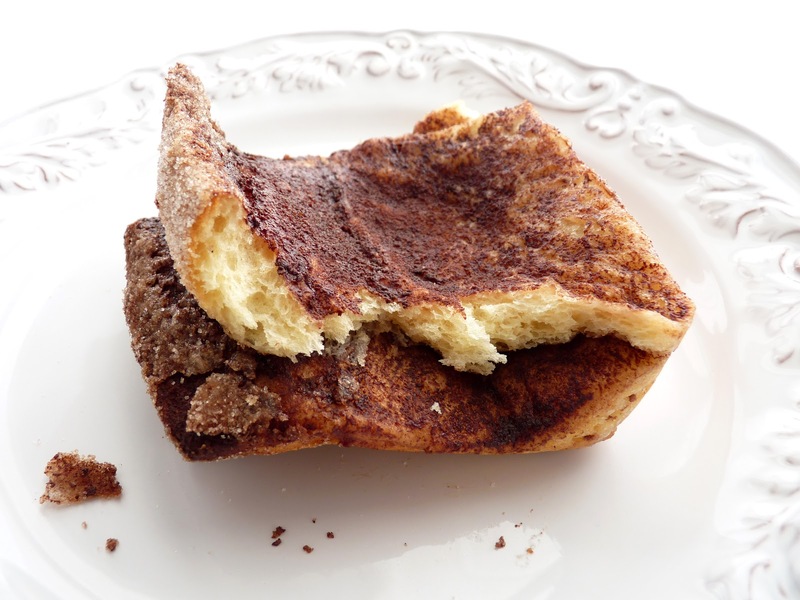 In a separate bowl, combine the sugar, cardamom and cinnamon. Set aside. Gently deflate the dough. Place on a work surface with a very light dusting of flour. Roll the dough out to a 20" x 12" rectangle. Using a pastry brush or a small offset spatula, spread the cocoa paste over the entire surface of the dough. Sprinkle with all but about 2 teaspoons of the sugar and spice mixture. Cut the dough lengthwise into five 12" x 4" strips. Gently lift and stack them on top of each other. Don't worry about making the stacks look too neat; they needn't be perfect. Cut the stack into four equal pieces. 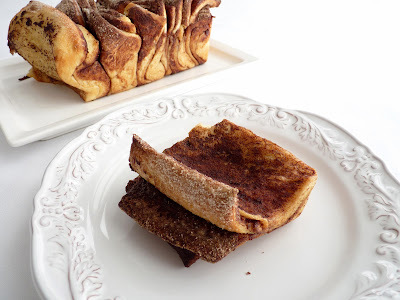 Line the prepared loaf pan with the stacked pieces, placing them upright in a row. Adjust them so they are evenly placed across the length of the pan. It will seem like there aren't enough but the dough will rise and expand during the second rise and the baking process. Sprinkle the top of the loaf with the remaining sugar and set the loaf aside in a warm place to rise for another 45 minutes. Preheat the oven to 350 degrees. Bake until the top of the loaf is golden brown, about 25 minutes. Set on a wire rack to cool for 5 minutes. Lift the yeast bread out of the pan using the paper overhang to assist. Remove the parchment and cool completely. I really enjoy Suzanne Goin's approach to food. Her dishes are simple, rustic and satisfying. She runs four acclaimed restaurants in Los Angeles. At Tavern, there's an in-house bakery called Larder with lots of gorgeous stuff. Her cookbook, Sunday Suppers at Lucques, won an award from the James Beard Foundation and the pastry recipes I've tried have all been delicious. And since we're heading into Guinness and chocolate territory over the next several days, I thought I'd try her Chocolate Stout Cake. 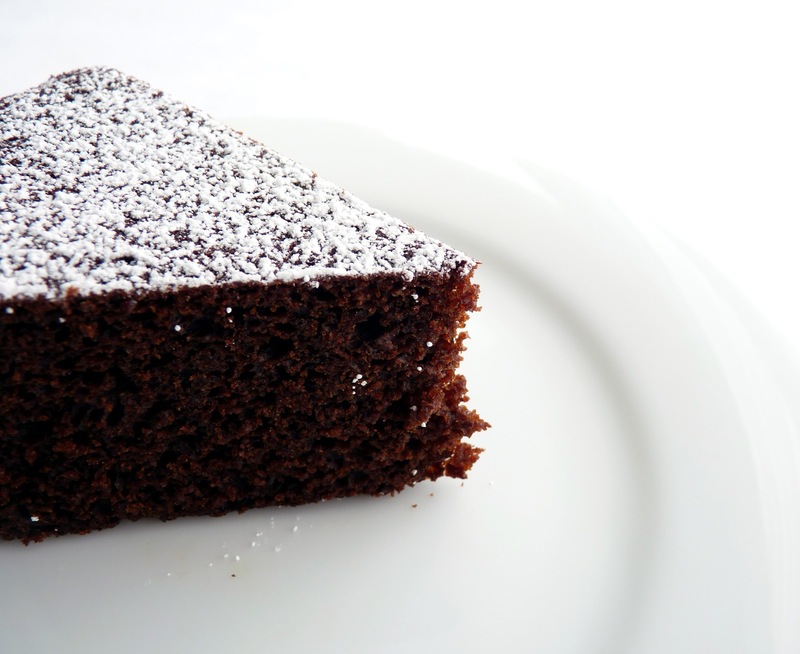 The interesting thing about this cake is that the chocolate really takes a back seat to the bold flavor of molasses and the addition of lots of spice. There are equal parts of ground cloves, cinnamon and nutmeg, so there's no mistaking the fact that this cake has a gingerbread feel. The Guinness bridges all these strong elements and rounds out the flavor beautifully. 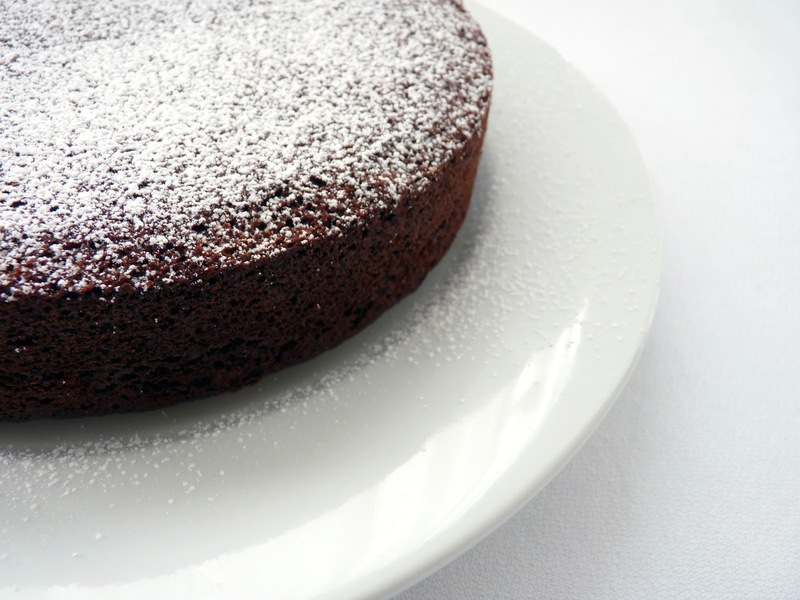 The cake is made with oil so it's quick to mix and super moist. I like it simply served with a dollop of whipped cream. It would also be terrific with vanilla or caramel ice cream, of course! - I haven't tried this with any other brand of beer so I recommend you go with Guinness. - I halved the recipe to bake in an 8" cake pan. If you'd like to double the recipe and bake in a bundt pan as Suzanne does, use 3 whole eggs. - Note that the baking soda is added to the molasses and beer rather than sifted with the dry ingredients. - Use natural cocoa powder rather than dutched. - Store cake in an airtight container. Preheat oven to 350 degrees. Lightly grease an 8" x 2" round cake pan and line the bottom with parchment. Sift together the flour, cocoa powder, baking powder, cloves, cinnamon and nutmeg [and salt, if using]. Place the beer and molasses in a saucepan and bring to a boil. Remove from the heat and whisk in the baking soda. The mixture will rise and foam. In another bowl, whisk the egg, egg yolk and both sugars until thoroughly combined. Whisk in the oil and then add the beer mixture. Make a well in the center of the dry ingredients. Pour the liquid ingredients into the well. Whisk slowly just until the ingredients are incorporated. Pour the batter in the prepared pan and bake until a tester comes out mostly clean when inserted in the middle, about 28 - 30 minutes. Cool the cake on a wire rack for 10 minutes. Invert the cake and remove the parchment. Invert the cake again and cool completely. Dust with powdered sugar and serve. Each year as the seasons go by, I'm always taken aback at how swiftly and effortlessly fresh fruit and vegetables flow into the market. There's something uniquely joyful and renewing about seeing the arrival of different items in our produce department even though the calendar tells us to expect them. As spring is fast approaching, I'm once again really excited to greet the grand parade of color and supreme enjoyment of berries, cherries, apricots, peaches, nectarines and figs. Ah, primavera. However, there are some gorgeous oranges available right now, so it only makes sense to take another moment to focus on the luscious fresh quality of citrus. And since I love sherbet, I decided to keep it simple and make this orange version. I was hoping to feature blood oranges but they seem to have eluded me this week. If you can find them at your local market, do pick some up and enjoy them while they last. They are such a very special treat. Their super refreshing acidity and bright red color are stunning. Here I use ordinary navel oranges, which are always a welcome addition to any pastry kitchen. I've added a pinch of spice to the sherbet to keep things slightly more interesting. I like this subtle blend of cardamom, cinnamon and allspice but if you don't care for those, add a pinch of clove or steep some star anise. 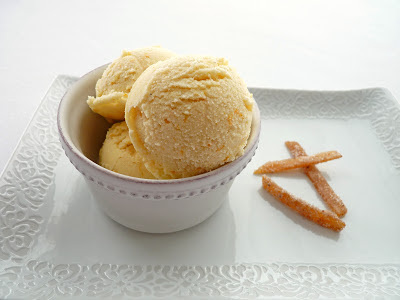 Or leave the spice out altogether and you still have a nice simple sherbet. Perfect to enjoy with your favorite cookie or a bite of chocolate. - Lemon juice bolsters the brightness of the orange juice. - Salt is very important for enhancing the flavor of both dairy and citrus, so add a pinch to the simmering cream and milk and then taste again and adjust for salt once you've added the orange and lemon juices. 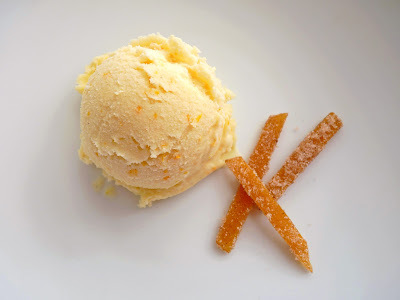 - Add a splash of Grand Marnier for a stronger pop of orange. - Let the sherbet sit for a few minutes to soften a bit before scooping and serving. Combine the cream, milk, sugar, orange zest, spices and a pinch of salt in a saucepan and bring to a simmer over medium low heat. Simmer until the sugar is dissolved. Take off the heat, add the orange juice and lemon juice and whisk until thoroughly combined. Taste and adjust for salt. Cool completely. Pour into an airtight container and place in the refrigerator to chill thoroughly, preferably overnight. Churn the sherbet according to your machine's instructions. Pour into an airtight container and pack it down firmly to eliminate any air pockets. Press a piece of plastic wrap into the surface, cover and place in the freezer to firm up. Peanuts ground to a pasty substance were likely a product of Aztec Native American culture hundreds of years ago. Although not particularly favored in Europe, peanut butter as we know it today is considered a household staple in the United States. Like all American kids, I grew up on peanut butter sandwiches. And, like everybody else, I never seemed to tire of them. The pairing of nutty, salty peanut butter and sweet fruity jam probably gave rise to my affinity for sweet-salty combinations. 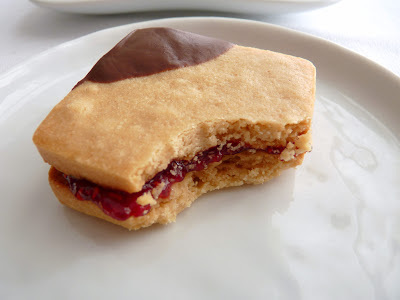 But it's been ages since I've had a peanut butter sandwich so I thought I'd remedy that with this cookie. This is a shortbread type of peanut butter cookie so it's crisp and crumbly and not terribly sweet. I love a good intense peanut butter cookie - you know, the kind we all got hooked on as kids - but this one has a subtler flavor. To bolster the subtlety, the jam and casual slight dip of chocolate bring the bling. The dough for this simple butter cookie comes together in a food processor, a most favored tool in my kitchen. Once the dough has had a thorough chilling, the cookies are cut out and baked, then on to the dipping and filling. Use your very favorite jam. I'm partial to raspberry. - Chill the cookie dough thoroughly so cookies hold their shape when baked. - Gently gather and re-roll scraps for additional cookies. 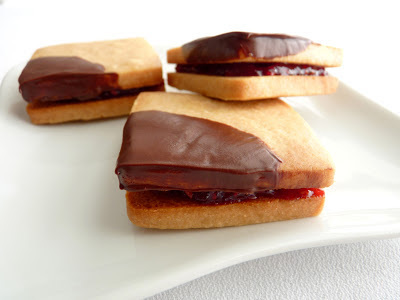 - If you're not a fan of jam, fill the cookies with chocolate or enjoy them plain. Or serve them with your favorite ice cream. - The cookies will soften when filled, so eat them soon after. 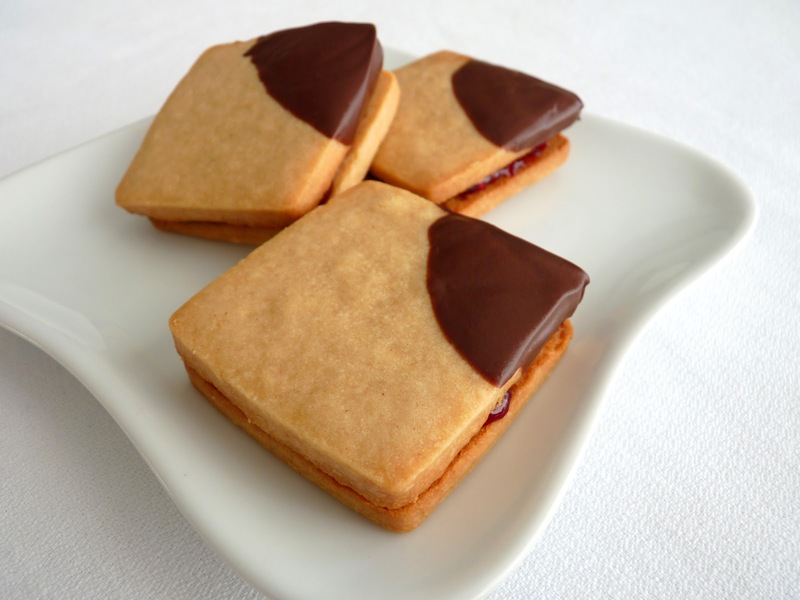 Unfilled and undipped cookies can be stored in an airtight container for a few days. - If you love peanut cookies, you must try this incredible Peanut Cookie Brittle. Place the flour, powdered sugar and salt in the bowl of a food processor and process to combine. Cut the cold butter into 1/2" pieces and add to the flour mixture along with the peanut butter. Process until it looks like course meal. Add the egg yolk and vanilla and process until the dough begins to clump around the center of the machine. Gather the dough and place on a piece of plastic wrap. Cover with another piece of plastic wrap and roll out to about a 10 1/2" square. Slide onto a sheet pan and refrigerate until completely chilled. When ready to bake, preheat oven to 350 degrees. Line two baking sheets with parchment or silpats. Remove the sheet of cookie dough from the refrigerator and lift off the plastic wrap from both sides. Using a 2" square cookie cutter or other similar sized shape, cut out cookies and place on prepared cookie sheets. Bake the cookies until the edges just start to take on some color, about 12 minutes, rotating the baking sheets halfway through. Cool the pans on a wire rack. Chop the chocolate into very small pieces and place in a small heatproof bowl. Add the butter and melt together over a water bath, whisking to thoroughly combine. Dip a portion of 12 of the cookies in the chocolate, scraping against the side of the bowl to eliminate any extra. Set on a wire rack to dry. Spread the other half of the cookies with your favorite jam and sandwich the cookies together.